Glowy: How to Stretch Out Your Very Tight Shoes. How to Stretch Out Your Very Tight Shoes. Hey guys.... today's post is in reference to yesterdays post check here where we received comments from most of us complaining about tight shoes. well i will try and outline few details points on how to stretch out your shoes and i really hope this will be the long last solution for the tight shoes problem. If you want to give out a few bucks, take your shoes to a local cobbler, where they can be stretched out to your liking. Going this route does require some time and effort on your part. There are some other ways you can try to stretch your shoes that won’t cost you anything. In order to be able to wear those shoes for long periods, such as all day at work or all evening at a social gathering, you’re going to have to make them more comfortable. In previous posts, i've empahsised on the need in Wearing your shoes at home for short periods will help loosen the material and stretch out the shoes. When the shoes hurt your feet, just take them off. To speed up the process, wear a thick pair of socks—or several pairs—before you stuff the shoes on your feet. An alternative to stretching out the shoes with your own feet is to insert other items into your tight pair of shoes. Try over-stuffing socks into the shoes or crumpled up newspaper. A number of shoe-stretching tools are out there specifically for the purpose of stretching out shoes. 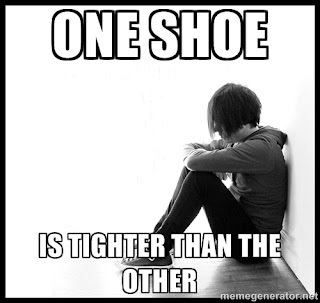 Shoe stretchers can adjust the length as well as width of a shoe. Just be careful not to get the shoe too loose. Shoe stretchers can work fine but will cost you maybe $20 or so. This method guys might actually make you feel skeptical yea but trust me darlings it works all the time. We have all heard that water expands as it freezes. Well, freezing your shoes also expands them. All you have to do if fill a sandwich bag for each foot with water about 1/4th full. Insert the bags up into your shoes, stick them in the freezer and leave them there until the water freezes. Once it does, allow it to thaw, take out the bags, and try on your shoes. If one round of freezing doesn’t do the trick, try a second time. This method can be a little tricky, as you will need to make sure the water doesn’t leak when put inside the shoe. For shoes (such as canvas) that can get wet, however, freezing the whole shoe can work as well. Get the whole shoe wet, add the water inside, and freeze it all. When everything thaws out, hopefully you will have a shoe that fits. Besides freezing shoes, heating shoes that are too tight is another popular method. To do this, put on some thick socks and then your shoes. Get out the hairdryer, put it on high heat, and heat the shoe in the areas where it is tight. As you do this, flex your feet, bending your toes back and forth to move the shoe material as much as you can. This method doesn’t sound very comfortable, but it works. Both the freezing method and the heating method are known to stretch shoe sizes from a half to a whole size. Leather works the best since, once stretched, it is less likely to go back to its original size. Now that you are armed with several ways to stretch out your shoes, go through your closet and pull out all the ones that need to be stretched. Never again will there be such a thing as shoes that are too tight. with these few detailed points, i just hope you guys will come back and tell me you are fine. This is for those complaining about their bunions... this problem has so many solution such as the bunion belt below..
the above image is not the only design the belt comes in, it also comes in small shapes depending on what you want..
all you need do is walk into any big store or super market and ask for bunion belt or you can even google the name to get more pictures so you can show as sample. at first it might feel strange when you wear it with your shoes, but as time goes on, it will help reduce the pain. The same goes for corns on feet. ...great insight even for male footwears too. This is very very helpful. Thanks for sharing this. By fire by force those shoes must fit. Wow! You are a saver. Now it's about time to experiment. oh k.Nice... Will try that. All this for shoe? Chai, kuku go buy another shoe!!! !